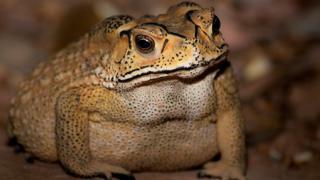 An invasive species of Asian toad could devastate wildlife on Madagascar, according to biologists at Bangor University. They are part of an international team which says the toad's poisonous skin will kill animals preying on them. It is thought they only arrived on the African island around 2010 as "stowaways" on ships. South-east Asian predators have evolved immunity to the toxin, which animals in the closed Madagascan ecosystem lack. Whilst the toads are yet to have a major impact, the team's study has confirmed that all but one of Madagascar's native predators lack the gene which renders the toxin harmless. How close is Japanese knotweed to my home? Dr Wolfgang Wüster, of Bangor University's School of Biological Sciences, said: "The fear is that the toads will send shockwaves through the entire ecosystem. "Our findings mean that resources can now be allocated based on robust data rather than supposition." The Asian toads - Duttaphrynus melanostictus - produce what are known as bufotoxins in large prominent parotoid glands on their backs. These chemicals impede the regulation of sodium and potassium in cells in predators, leading to rapid heart failure and death. The Bangor University scientists, along with colleagues in Liverpool, Munich, Stuttgart and Turin, found that in Madagascar only one rodent - the white-tailed antsangy - had the necessary gene to repel the toxin. This could mean extinction for creatures such as the cat-like fossa, which eats anything from lemurs to lizards, but could also spell trouble for humans. There are already anecdotal reports of snakes dying from eating the toads, leading to fears of a boom in rodent populations and the consequent impact on public health. In the longer term, it is hoped that native animals may adapt their behaviour through collective learning, and avoid eating the toads. Bangor University masters student Ben Marshall, who worked on the project, believes prevention is always better than cure. "Nature conservation managers should seriously take into consideration a program of local control of toad populations, assuming that a full eradication from Madagascar is already impossible." The research is published in June's Current Biology journal.